Where there are multiple images available in a single feed item, deciding which thumbnail to choose can be a challenge. It might seem obvious to choose the first image in a feed, however, this can often be a logo or icon which is not suitable as a thumbnail as it may be repeated down the page. In addition, some images are too small to represent as as thumbnail without an unpleasant grainy look as we would need to magnify the image to make it fit inside the thumbnail frame. Other unsuitable images include decorative images, such as a horizontal line or banner stripe. The ideal size ratios for thumbnail images are a rectangular 6:4 or 7:5 ratio, or square. 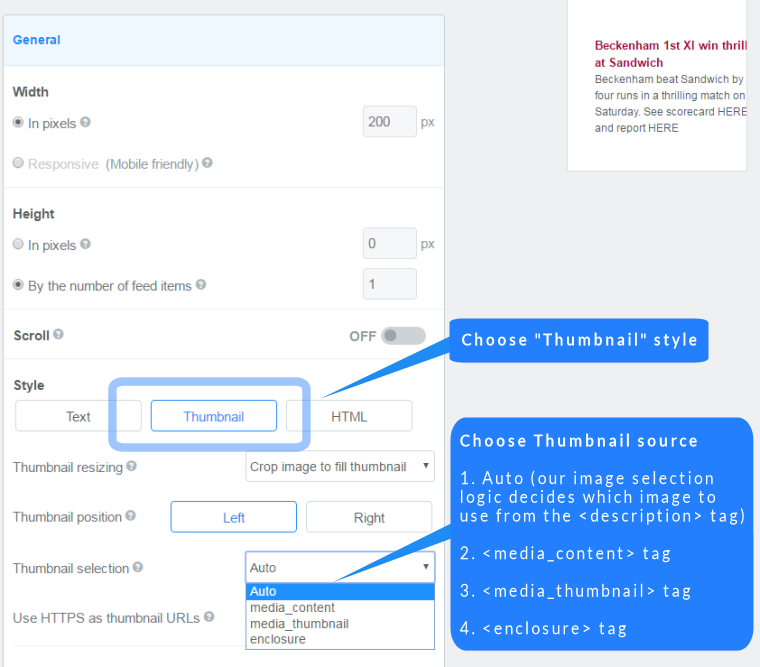 For this reason, over the years we have been developing FeedWind, we have defined specific logic steps which our parsing program uses when identifying the correct image for a thumbnail. With “Auto” selected as the Image source in the FeedWind setup screen, the following image selection logic is applied. Basic selection logic: We select the image with the largest sum of height + width which we find in the <description> tage of the XML. With “media_content“, “media_thumbnail” or “enclosure” selected as the Image source in the FeedWind setup screen, the following image selection logic is applied. *If an image is not found, display the largest image. If you need help with images in your widgets – or anything else to do with Feedwind – please contact us.